Objective: To examine the relationship between home apnea monitoring and sociodemographic, socioeconomic, and medical factors and the risk for rehospitalization among very-low-birth-weight infants (birth weight <1500g). Design and Setting: Analysis of live infants born weighing less than 1500 g; these data were obtained from the 1988 National Maternal and Infant Health Survey. Data from this survey were obtained by maternal questionnaires and from birth certificates and medical records. Outcome Measure: One or more hospitalizations after discharge from the hospital of delivery. Results: Home apnea monitor use was strikingly lower among black infants (19.8%) compared with nonblack infants (43.7%) (P<.001). The rate of rehospitalization for blacks was 24.8%, which was lower than the rate of 34.3% for nonblacks (P=.001). Neither annual family income nor method of hospital payment was associated with rehospitalization. 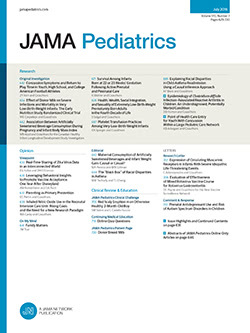 The use of an apnea monitor in the home was associated with an increased odds ratio for rehospitalization for both blacks (odds ratio, 2.56; 95% confidence interval, 1.56 to 4.21) and nonblacks (odds ratio, 2.28; 95% confidence interval, 1.51 to 3.45). With adjustment for the use of an apnea monitor, the odds ratio for rehospitalization of blacks vs nonblacks was no longer significant (odds ratio, 0.80; 95% confidence interval, 0.60 to 1.08).